Cold Water are the most popular, probably primarily due to cost and ease in manufacturing and use. They are generally limited to 140 degrees F – temperature from a hot water tap. They are broken into two types: electric or gas engine. 1. Electric are more compact and lower performance when electric current is limited to 115V. They are more economical and sold to consumer markets or for semi-professional use. 2. Gas and diesel engine units are more portable and used primarily outside when noise and gas fumes do not present a problem. Performance is limited by price you are prepared to pay to get the job done. Allison Iron Horse power washers are the industry’s most powerful and easiest to maintain. They are built exclusively for the professional contract cleaning industry. They are expensive on the front end but much less expensive over the long distance. They last much longer that standard power wash equipment. Hot Water units are primarily used for professional or industrial applications where high temperature is required to break down dirt more effectively. Because they consist of an oil burner and heating coil they tend to be more expensive and complicated to operate. They have however enjoyed probably the largest percent sales growth in the industry due to more efficient manufacturing and promotion. Most pumps have a dual packing design with a water recycling system which allows water to lubricate packings and bleed back minor leakage from slightly worn packings. When excessive wear occurs and pressure drops significantly packings should be changed. Remember a new pump will sometimes weep slightly until packing take a good set against plungers. Pump crankcase is very trouble free – like an automobile if properly maintained. Oil should be changed after initial 50 hour break in period and every 500 hours or annually thereafter or when oil gets milky. This could be caused by condensation from temperature changes or oil seal leakage which may occur if vented crankcase plug is not installed and seals are sucked in from vacuum created when oil heats up. Filters – a good inlet filter is a cheap price to pay to protect your pump from impurities that are in water. Rust, scale and sand can easily clog valves or scratch plungers. Use a 60-100 mesh screen of adequate size for flow and be sure it is checked and cleaned periodically. Pressure Gauges – are generally not used by most manufacturers as they tend to malfunction easily unless more expensive glycerin filled ones are used and they add to machine cost. They do however, serve an important role as a ready warning to nozzle wear or pump seal damage which reducing cleaning effect and potentially more expensive repair later. In a professional contractor environment a pressure gauge is highly recommended. 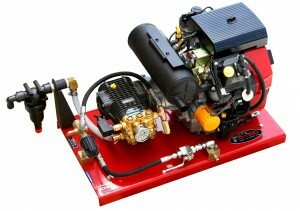 Unloader Valves – this is the main safety component of a pressure washer. It along with the trigger gun literally controls the traffic flow of water in the system. Without an unloader valve when gun is shut off the pressure will continue to rise until either the motor – engine stalls or pump, hose or gun ruptures. Unloaders divert all or part of the flow to a supply tank or the inlet of pump to prevent pressure from building up. When gun is opened water moves from outlet of pump through hose to gun and nozzle. When trigger is released the valve closes and the unloader is activated either by an increase in pressure (pressure actuated type) or a reduction in flow (flow actuated type). Water flows into channel and pushes piston down which opens bypass valve. The unloader diverts flow of water from outlet side of pump back to inlet side causing water to flow back to pump virtually under no pressure. Advantages of flow actuated unloaders is that hose and pump pressure is reduced in unload mode. This is safer for hot water coil and when operator does not want fast kick back when gun trigger is depressed. It however, cannot be used on multi gun systems and is generally more expensive and sensitive to adjust. Pressure actuated type is the common. It traps pressure in hose during unload mode so immediate pressure is available when gun is opened. Pressure of system can be controlled to some extend by adjusting the tension on the spring holding the piston in the valve in place. Changing nozzle is preferred method of controlling pressure and unloader should only be adjusted to fine tune the system. If the unloader valve goes on/off when gun is shut off either the spring is not properly adjusted or there is a leak in hose, gun or connections. Too tight a spring tension can create a safety problem due to high pressure spikes before it unloads. Sleight bypass of liquid prevents valve erosion.